Living and LOVING the gluten-free life! I am rating this product ♥♥♥♥ with a score of 18 out of 20. Appearance: Bite size pieces without all the cracks and crumbs you often see with chips. While I doubt it there will be leftovers, the packaging has a zip top so that you can store them without worrying about them getting stale. Flavor: The butter flavored ones are very tasty, with a hint of salt (not too much like some of the store-bought puffed corn) followed by a nice buttery wallop. The caramel corn was smooth with a buttery, sweetness that made you want more. Texture: The butter flavor corn melts in your mouth. You don’t even need to chew if you don’t want to. 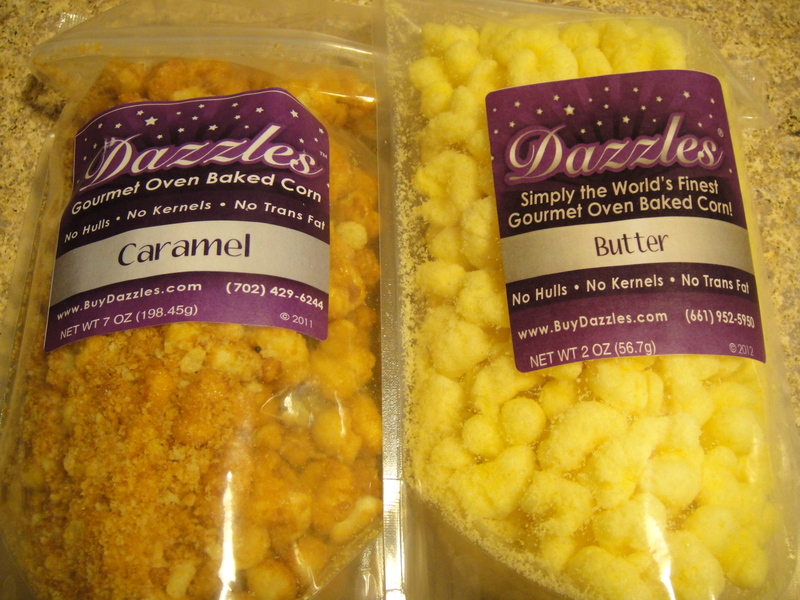 The caramel corn first has a crunch then a burst of sweet followed by melt in your mouth. No hulls to get stuck between your teeth either. Price: This was the only bummer. It is $5.00 for a 12″ bag of these treats (plus shipping). However, it is understandable that having gourmet flavor choices with premium ingredients (which you can taste in every bite, especially the caramel), it is expected to be higher in price than some other snacks. Above are all the facts I found to be true. Now here are my thoughts – I feel this snack is worth the $5 a bag. When I tasted the caramel corn, it actually made me close my eyes for a second! 🙂 True story. It tasted like something that my mom might have made in her kitchen. I checked their website to see what other flavors they offered and almost fell off my chair. I figured that there must be some mistake in the gluten-free listing. I actually CALLED them to verify that ALL of the flavors were gluten-free. I spoke to a woman, who for the life of me I can’t remember her name, but she was super nice and very patient with me. I am sure she thought I was a nut because I asked her repeatedly about gluten in different flavors and she assured me that everything they make is gluten-free. Check out some of these flavors – Garlic, Nacho Cheddar, Three Chili White Cheddar, Jalapeño Cheddar, White Cheddar, BBQ, Ranch, Cinnamon Krunch, S’mores, Moose Krunch (chocolate, caramel and butter) Yesss!! Seasonal flavors (not in season now but I will have to keep an eye out for them): White Chocolate Raspberry and White Chocolate Irish Cream – ARE YOU KIDDING ME?! Hecky yeah!! If you’ve been gluten-free for any length of time, you know how hard it is to find FLAVORED snacks that are not laced with gluten. This is a great find for us! Here are a couple more awesome facts that I REALLY appreciate about this product: This corn is NON GMO! There is NO MSG! There are several no sugar added flavors so this is a great snack of diabetics too. Go check out this site right now and get yourself some and enjoy a snack with me!! Previous Post Coconut Flour POWER COOKIES! Sounds like a paid post. Nobody is going to put a review listing ALL of the flavors that the company offers. Paid review just lost my business. Sorry you feel this way Dan. You are entitled to your opinion. There are absolutely no paid reviews on my blog. Not one. I am a foodie and a huge fan of popcorn. Having to go gluten free was a difficult transition for me and finding products that actually taste good and have lots of flavors excites me. If you check my other reviews, I research each product I review and give readers and idea of what else is available from that company, ESPECIALLY if it is as good as this popcorn is. I mean really…….anyone who is a popcorn lover like myself who comes across this post will be very happy to see they have some super cool flavors! Isn’t that the point of reviews in the first place?